Bangkok (Thailand) – July 3, 2018 (travelindex.com) – On June 20, 2018, we met at the splendid Landmark Bangkok Hotel to discuss the hottest topics concerning everything digital in the travel industry and get in some quality networking. From dawn till dusk, our speakers and panelists shared the newest insights in areas such as smart technologies and destinations, cross-border digital transactions, how disruption drives innovation and much more. “Once more, everyone did their part and brought valuable information to the table. The spirit of sharing and collaboration we experienced at the Digi.travel conference this year was amazing, and we are more than looking forward to continuing our great work next year,” says Theodore Koumelis, Co-Founder of Travel Media Applications and owner of the Digi.travel World Events. We take this moment to thank everyone who attended the event and made it fun, entertaining and informative. We thank our sponsors, Equnix Business Solutions, PT WebConnection.Asia, Move Ahead Media, Paypal Thailand Limited, Active Lifestyle Group, IFree Group East Malaysia and Compass Edge. Of course, we also thank our Digi.travel Leaders 12Go Asia, Sure2Trips, Thai Airways and Jones Lang Lasalle as well as our official partners Midas PR Group, Asia Media News and David Barrett for their dedication and hard work! Finally, another big ‘thank you’ goes to our session producers from the Pacific Asia Travel Association, HSMAI Asia Pacific and our Chairperson, Dr. Jutamas Jan Wisansing. Your contribution made this conference amazing! “The quality of content shared at the event was outstanding. So were the attendees and management. Joining Digi.travel was a great way to share information we’ve gained at our company and in return hear our audience’s feedback as well as other panelist’s findings and opinions. All in all, everything was great, and I am already looking forward to the next Digi.travel event,” explains Michael Waitze, one of this year’s speakers. Missed this year’s event? Don’t worry, we’ll be back next year, 19th June 2019, with another round of the Digi.travel Conference and Expo! 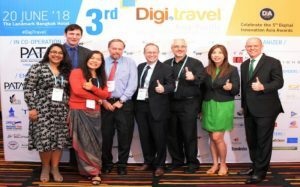 “The 3rd Digi.travel Conference and Expo was another wonderful event where everyone learned so much about the countless new digital trends in the travel and tourism industry. I am delighted to have been part of this conference and am looking forward to reconnecting with our community next year when it goes into its fourth round,” says Dr. Jutamas Jan Wisansing, Chairperson of the conference and the PATA Thailand Chapter.